Rated R for sequences of strong violence, and some language. Hollywood has been trying to figure out how to turn the Hitman video game franchise into cinematic gold for over twelve years now. The Eidos Interactive game about a cloned assassin-for-hire has long been a hit for gamers, and seemed like a perfect fit for an action franchise. Unfortunately, the first results were less than stellar. After four years in development, 2007’s Hitman featured a seemingly apt star in Timothy Olyphant but earned the ire of critics and fans alike due to its incoherent plot and sketchy acting. That didn’t mean Hollywood was going to let go so easy though. Despite the withering reviews from all quarters, Hitman was a box office success thanks to overseas gross that brought it to $100 million worldwide on a $24 million budget. Instead of trying to improve on the franchise with a sequel, Fox decided to put it through the ever-popular reboot treatment. With Homeland star Rupert Friend in front of the camera and feature film newcomer Aleksander Bach behind it, Hitman: Agent 47 tries to find a new level of success for the franchise, but with the same depressing results. The film stars Friend as the titular agent, part of a program to create the perfect assassin. Genetically engineered from birth to be the perfect killing machines, the Agent program went awry when the man behind the project, Dr. Litvenko (Hinds) went on the run, and the agents split away from their masters. 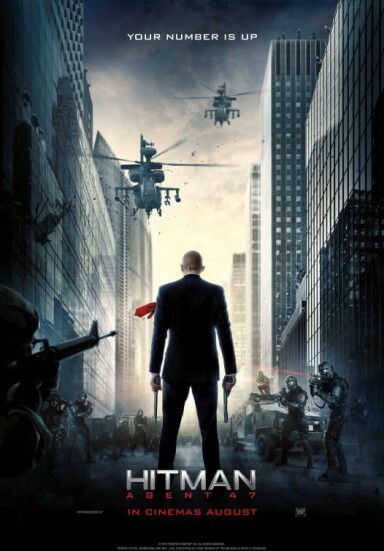 Agent 47 now works for an organization which seeks to prevent the competing Syndicate Corporation — headed by the amoral Le Clerq (Kretschmann) — from replicating the experiment to create an army of like-minded killers. The war between these two shadowy groups centers on trying to locate a young woman named Katia (Ware). Katia is a woman on the run, hunting for Litvenko without understanding exactly why. Agent 47 is under orders to eliminate her and his primary target, which throws him into conflict when Katia encounters John Smith (Quinto) just in time. John works for Syndicate and tells Katia that her life is in danger, but she soon finds that nothing is what it seems and 47 has some important answers to questions she’s been seeking her entire life. Katie must determine who she can trust, while Agent 47 must decide between following his orders for the greater good and following the conscience that was supposedly engineered out of him. For Hitman: Agent 47, Fox retained just one member of the first film’s creative team and it’s the one they probably should have left behind: Skip Woods. Woods wrote the script for both films (helped out this time around by Michael Finch) and it’s crystal clear at this point that he doesn’t know how to make this story work. Woods is previously known for the scripts for X-Men Origins: Wolverine, A Good Day to Die Hard and Swordfish, all of which were extremely lacking stories. He isn’t any better here, as he seems more interested in cutting and pasting sequences from the likes of Resident Evil and his own Wolverine than crafting any sort of intriguing story. Woods seems a proponent of the “actions guide characters” method of storytelling, in which no real sense of character depth is needed as long as there are enough plot twists thrown into our face. The shifting loyalties that are more rapid-fire than any gun in Agent 47 or Syndicate’s arsenal keep trying to throw blinders on its audience so that when Katia — a walking MacGuffin whose very name has a silly code to it — ends up in the clutches of one side or the other, we don’t question it. We don’t have any character motivations here because Woods doesn’t want us to think too long. If we do, the whole thing falls apart. And that’s fine; this is a relatively low-rent action film, not an in-depth character study. There’s nothing wrong with a film that requires us to turn our brains off to enjoy; Universal managed to make great films out of both Jurassic World and Furious 7 using that as its guiding star. But Hitman: Agent 47 wants to have its cake and eat it too. You can’t turn off your brain when sometimes-contradictory exposition, betrayals and double-crosses are being haphazardly thrown at the screen every time we’re not in the middle of an action scene, and you can’t be expected to care about what’s going on when the characters are little more than half-thought out archetypes. Woods’ dialogue is hackneyed and wacky leaps in logic and plot holes riddle the story. And that’s just the generics. When you bore down into specifics, things make even less sense. Take character details around the genetic engineering of the cloned Agents. It’s supposed to give you enhanced reflexes, intellect and remove things like fear, doubt and love. Unfortunately, that doesn’t explain how one character with these abilities seems to have some kind of precognition, seeing Agent 47 approaching them in specifics that go beyond what the abilities imply. This could be a fault of Bach’s attempts to portray the abilities; either way it’s a failure of the film. And Katia’s character is a can of worms that makes one’s brain hurt if you think about it too long; the revelations about who she is and why she’s important frankly make no sense. John Smith is little more than a walking douche ex machina (that is not a typo), with no attempts to get much more interesting than the phrase “subdermal titanium body armor.” And despite making two films from it, Woods clearly doesn’t understand the game franchise as Agent 47 has no interest in being a silent killer, preferring to take on his opponents in loud, explosive shootouts. The list goes on. While the script is laughably bad, it’s unfortunate to see that Agent 47 isn’t able to improve on the acting from its predecessor either. Comparing Rupert Friend’s 47 to Tim Olyphant’s, it is the latter who gave the character more drive and a more interesting portrayal. Friend, who is so good on Homeland, seems to be on cruise control as he plays 47 with an almost passive malaise. It’s the standard sort of disaffected portrayal that seems to be stock for “antisocial loner,” which is about all we get from a read on this 47. Hannah Ware does her best to make an interesting female protagonist out of the mess that is Katia and partially succeeds; Zachary Quinto oozes sleazy determination as John Smith. The supporting cast tries ably but isn’t able to overcome the limitations of their roles but can’t do so; Ciaran Hinds is dealt yet another cinematic injustice with Dr. Litvenko and Thomas Kretschmann seems like he filmed nearly all of his scenes for Syndicate boss Le Clerq during a cold reading in-between filming for his too-few scenes in Avengers: Age of Ultron. The one thing that Agent 47 gets right a fair amount of the time is the action. Aside from some very spotty CGI blood (say it ain’t so, ILM! ), Bach’s background directing music videos and commercials serves him well here in that he makes some of the scenes feel appropriately amped. He has a tendency to veer too much into jumbled quick-cut editing, but a chase scene in a parking garage gets the blood racing well and he doesn’t skimp on the blood, an essential thing for a film about a hitman. It doesn’t hit the mark every time though and the “bad guys can’t aim” trope hits some very silly heights in the final act, which culminates in an anti-climactic, unsatisfying moment. At various points in the film, Katia tries to impress upon 47 the aphorism that “we determine who we are by what we do.” If that’s the case, then Agent 47 is the living embodiment of an action film gone wrong, a physics-defying film that sees no problem with a woman literally doing a handstand on a chair in front of an active jet engine without being sucked into it, let alone knocked off-balance. Dumb action films can be fun, but they have to actually…you know, be fun. While there is the traditional mid-credits sequel-teasing stinger here, one can hope that Fox has finally realized there’s no life to be hand in this franchise and lets it fade away into quiet retirement, where it can’t hurt anyone ever again. Hitman: Agent 47 follows in the footsteps of its predecessor in missing its target by a wide mark. In fact, it may be close but this reboot probably misses even worse. Skip Woods' script fumbles about like a catnip-stoned kitten trying to do calculus, throwing out one plot twist and betrayal after another in a futile attempt to distract the viewer from just how dumb the whole thing is. Most of the performances are unable to rise above the hackneyed material while Aleksander Bach's action isn't able to make up the difference. The result is a mess of a film that is infinitely (and blessedly) forgettable amongst far better action films to come out this year.